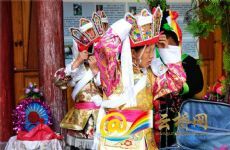 Diqing inheritor (7) Li Lihua dances Reba in Tacheng for blessing, happiness . 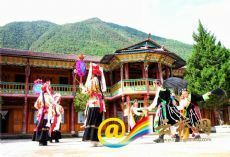 孏he Reba dancing in Tacheng used to be a pray for blessing. Now, we dance to show our happy life,� said Li Lihua, a Reba inheritor at the prefectural level. On August 30 morning, the 38-year-old Li Lihua was resting on the stone steps outside the Reba Protection and Training Center in Tacheng Town, northwest Yunnanϋ Diqing Tibetan Autonomous Prefecture. She just led local folks in a Reba dancing. 诗s a intangible heritage inheritor, I feel we are living in a best time.� Li Lihuaϋ words were echoed by He Jinying, a county-level inheritor aged 48. Jin Yingϋ father was a local master in the Reba dancing, who passed down his dancing skills to both Li Lihua and his daughter. The master has passed away. To better inherit the skills, they joined hands with local villagers and set up in 2015 the Tacheng Classical Reba Industry Association. In 2014, the State Council rated the Reba dancing as an intangible heritage at the national level. The art is highly popular in five towns and townships in Deqin, Weixi and Shangri-La. As the Reba inheritor of Tacheng Town, Li Lihua sang with passion but told us the Reba story in a moderate tone: Bodhidharma, who was practicing Buddhism in Weixi, came to teach the dance in the countryside. This dancing is very particular in choosing the dancer, and the sage did not find a proper candidate until he visited the Yonggong village. In the Tibetan language, Yonggong Village means a place to receive blessings. It was believed that any place chosen for Reba is bound to prosper. 孏here used to be a famous Reba dancer and singer named Chudeng,� Li Lihua recalled. Chudeng was the next-door neighbor of Li Lihua, and his voice could be clearly heard at Liϋ home. The father also learned Reba from Chudeng and taught Li Lihua at leisure. 孏he Tacheng Reba is divided in 24 singing and dancing pieces, and it usually takes a learner more than 3 years to complete all 24 pieces.� Li Lihua and He Jinying have mastered all 24, and they take the lead both in dancing and singing. On the man actors� costumes, there are some seven-color strips, with the colors representing the blue sky, white clouds, the sun, the mountains, the lakes, the rice, and the carp. The women's dress features a drum pattern with the sun and the moon painted on its sides. 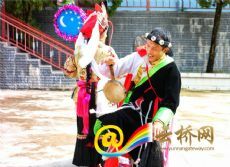 He Jinying added her costume set costs about 20,000 yuan, and some villagers have better and more expensive costumes. In the Yingduwan villagers� group, all folks in the 78 households can dance Reba, but the annual group dance is still grand, formal and ceremonious. The group dance used to be held on the eighth day of the second lunar month annually. Starting in 2013, the group Reba falls on the third day, so that some villagers can leave home earlier to work as migrant workers. 觻 still keep learning the Tacheng Reba for teaching,� Li Lihua said he teaches the dance in the primary and secondary schools in Weixi and Shangri-La. 诗nd hand-made costumes at the Reba industry association are favored by local schools, bringing more income to the villagers. 孏ourism also enriches the Reba dancers.� He Jinying added a neighboring village set up a tourist company this June. Members of the Reba industry association danced for the tourists, earning nearly 4,000 yuan. ጃarlier this year the performing team got an invitation from Russia, but we did not go there due to high cast in travel.� Li Lihua has seen craze for the Reba dance.